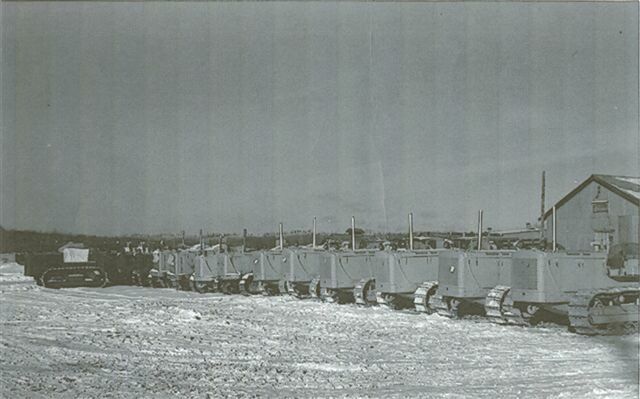 WITH THE D6 9U BEING A VERY POPULAR WINTER FREIGHTING CAT, IT WAS VERY COMMON TO HAVE FEW CATS IN THE FLEET. SO ON THIS PAGE OF THE WEBSITE I THOUGHT I WOULD POST A FEW PICTURES OF ALL THE CATS TOGETHER. 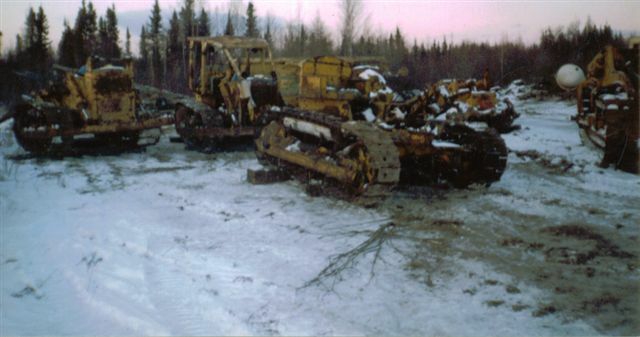 THIS PICTURE WAS GIVEN TO ME BY GARTH D. AND IT SHOWS ALL THE CATS, IH CRAWLERS AND LINN TRACTORS USED ON THE SHERRIDON - LYNN LAKE HAUL WHEN THE TOWN MOVED. JUST A QUICK PICTURE OF "THE HOOD", BISMARK" AND "ROLLER-LESS" WAITING IN ILFORD, MANITOBA TO BE HAULED HOME TO THE "KINGDOM"